Luke and Pat Dobben live on a dairy farm in southwestern Ontario. The Dobbens live in a 1,900 sq. 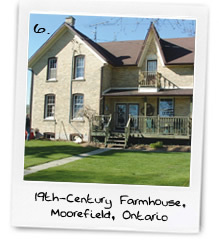 ft. farmhouse that is 120 years old and has double-brick walls. Only the kitchen, bathroom, and one bedroom are insulated. The Dobbens have a large yard and fields surrounding their house. During the winter of 2004, the Dobbens spent over $4,000 heating their home with fuel oil. The oil furnace still did not keep their home warm enough for their liking. The Dobbens wanted a system that would cost them less in monthly bills and heat and cool their home more effectively. They wanted a system that would operate efficiently without any major renovations or upgrades needing to be done to the home itself. A local Geothermal Specialist designed and installed the geothermal system. A horizontal loop measuring 3,600 ft. in length was buried in the field beside the house. A forced air unit was installed in the basement along with a small amount of ductwork. The Dobbens removed the central air conditioning system they had used previously, as the geothermal system will now fulfill the cooling function. The full installation of the geothermal system was carried out over the course of three days. Our Geothermal Specialist also sold the Dobbens a 40 gallon preheat and a 60 gallon water heater to replace the oil-heated water tank that was removed with the oil furnace. The geothermal system provides a high level of comfort and cost savings year round. The Dobbens have reported that over the course of the hot, humid summer of 2005, the system provided air conditioning that was cooler than the previous central air unit was able to deliver. Due to the tremendous efficiency of the geothermal system, the Dobbens are saving approximately 65% annually on their heating bill, which resulted in a savings of $2,600 over a fuel oil system last winter alone. With the additional savings on air conditioning and hot water bills, the Dobbens can expect to get a full return on their investment in eight years (at current oil prices). The Dobbens are also eligible for the 'Energuide for Homes' federal grant for installing a geothermal system. The Dobbens are enjoying the full comfort of a geothermal system and much reduced operating costs without any upgrades to their home. The geothermal solution is effective in any household, and is ideally suited to the rural environment.